We were the first to tell you last year that Samsung has a new Windows 10 tablet in the pipeline. It’s going to take the baton from the Galaxy TabPro S, the first Windows 10 hybrid tablet from Samsung. It’s widely believed that Samsung is going to call the successor the Galaxy TabPro S2. Last week this tablet received its Wi-Fi certification and it has got its Bluetooth certification now. 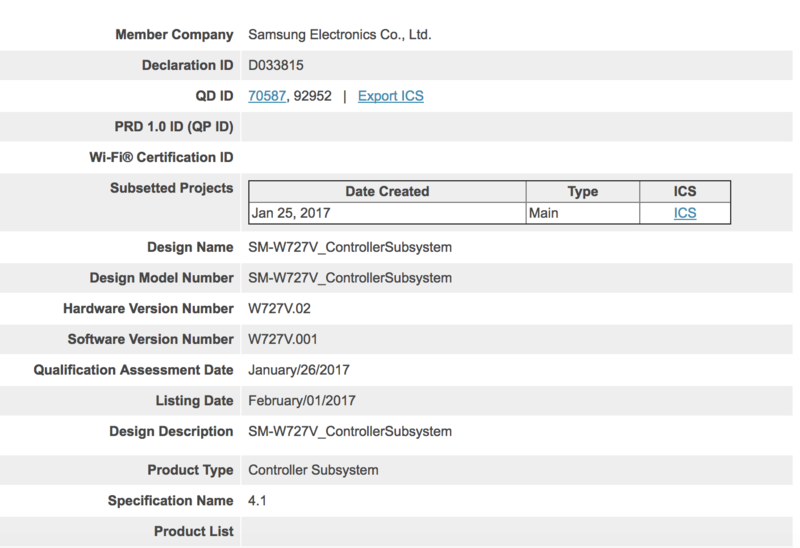 The Galaxy TabPro S2 bearing model number SM-W727V has received its Bluetooth certification. This might be the Wi-Fi only model but it’s highly likely that one with LTE support is going to be released as well. Not a lot if known about this tablet’s specifications but it’s possibly going to feature a 12-inch 2160×1440 pixel resolution Super AMOLED display as well as the latest Core M series processors from Intel. Samsung is expected to unveil the Galaxy TabPro S2 at the Mobile World Congress 2017 on February 26. It may possibly launch the Android-powered Galaxy Tab S3 at the event. Recent reports suggest that we might even get to see a short video of the Galaxy S8 at MWC 2017. Why on earth would you prefer 16:10 to 3:2? Look forward to seeing the specs. I still have my 4 year old Samsung Ativ Pro 700t hybrid with i5 processor and Windows 10. A real workhorse, still going great and superfast but it’s a bit thick and heavy by todays standard so time for a change soon. Depending on the spec this could be it’s replacement.